When a local large Automotive OEM wanted to upgrade its paint and sealant product line, they decided to design a robotic work cell. Many, OEM’s integrators and end-users must take into account many variables and components to ensure its success. In this situation, we have found that cabling is one element of robotic work cells that is often overlooked during the design phase. Cable Wire Protection is often just an afterthought in robotic work cells. After the end-of-arm tooling is selected, the programming is done and safety mechanisms are installed, the last thought is usually the cabling. In most cases, wiring and lack of cable wire protection systems are the components that will give the work cell the most trouble, so engineering them later will be more difficult. If cable routing is engineered during the design of the work cell, integrators can plan for them correctly. We find that in most cases, the common mistake is the typically the simplest. We replace many cables that were not designed for the applications. Many integrators use off-the-shelf hoses and cheap wiring configurations that are not intended for a flexing environment such as paint line robotic cells at this particular Automotive OEM. In fact at this particular large OEM they decided to just use standard cables and hoses and to use tie wraps with little or no wire protection. Without proper wire protection, cable wear can be one of the first things to cause downtime on a robot work cells. Within one month of installing the new robotic cell the wires were beginning to show signs of damage and the robot required downtime maintenance and repair impeding on the process improvements. The sales and engineering staff at Moltec International worked with the electrical team at this automotive OEM to design in and help ensure that the right conduit cable wire protection systems are used. 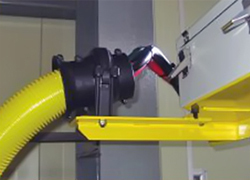 We ensured that the robotic cell had the correct comprehensive GRIP LOCK line of conduits, fittings, supports and swivels to meet needs for this particular application and significantly increased the life cycle of the installation. After a successful installation of a cable wire protection system, we never hear any issues from them again which is a good thing, since the robotic cells are in operation typically 24/7 with no issues of downtime due to wiring and cabling issues. 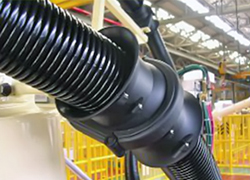 Moltec offers a range of robotic products that have been designed to protect cables and leads from damage in extreme automation and robotic installations. The GRIP LOCK robotic conduit, clamps, swivels and components protect the steer and lead elements against abrasion, push/pull, bending and torsion forces and our Robotic Polyamide 12 Conduit is specially manufactured to provide high quality and long service life in motion intensive applications. 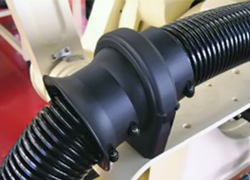 It is extremely flexible and can withstand up to 10,000,000 reverse bend cycles. Whether you require a dress package for a J6 robot or our comprehensive GRIP LOCK line of conduits, fittings, supports and swivels, we have the products that will meet the needs of any integrator.